Subject: Introduction of the Australian Road Rules - commenced 1/12/1999. To inform Council of the implications of the Australian Road Rules and particularly of the enforcement program for parking in the Pittwater Council area as a result of their implementation. 1. That Council acknowledges the introduction of the Australian Road Rules and the change to the current guiding principles for the enforcement of street parking. 2. That Council endorses the proposed education program. 3. That Council endorses the enforcement procedure outlined in Section 4.0 of the report. 4. That guidelines be prepared to address the evaluation process for areas where Council may consider a recommendation to the Traffic Committee for the approval of parking above the kerb in accordance with the Australian Road Rules. 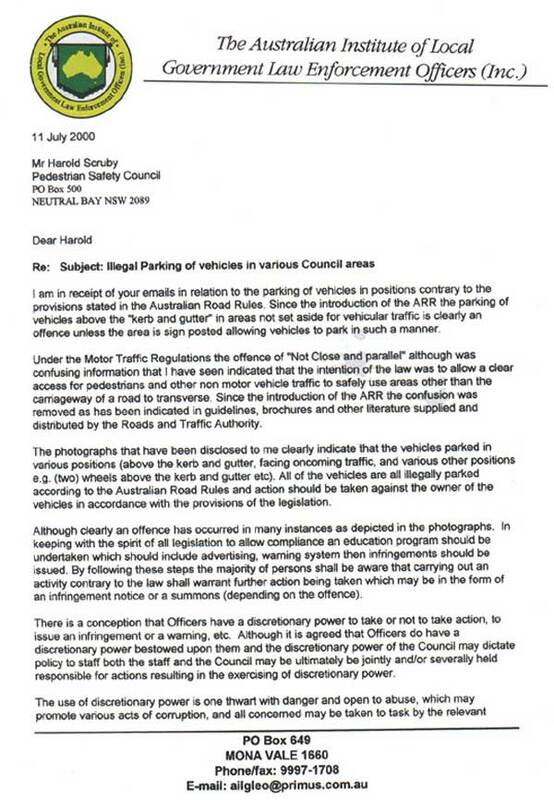 Given recent concerns by local residents about parking infringement notices being issued for parking within the road reserve areas and the specific terrain around Pittwater that makes legal parking difficult along some of our roads, the Council request an urgent meeting the Minister for Roads, Mr Carl Scully MP and his relevant senior officials, with the intention of instigating discussions with the aim of amending the Motor Traffic Regulations 1935. This delegation is to include the General Manager, The Mayor, relevant Senior Staff, interested Councillors and Mr John Brogden MP. To enable essential or emergency services to be performed. It is otherwise practicable to so park the vehicle. erection of �No Standing� signs on that carriageway or part thereof. Prior to part three being further considered, Council refers this matter to its Solicitors for further advice and report back to Council at the next meeting of this Committee on 22 February 1999. This resolution has provided the interim principles for the enforcement of street parking in Pittwater however, the introduction of new State legislation requires Council to reconsider the enforcement process. The Australian Road Rules (ARR) were introduced on 1 December 1999 replacing the Traffic Act, 1909 and the Motor Traffic Regulations, 1935. The new law is intended to create a basis for Australia wide uniformity in road rules to avoid the apparent confusion that affects road users travelling from one State to another and relates to both traffic movement and parking controls. Pittwater Council has a current contract with the New South Wales Police Service to manage and enforce street parking in all areas throughout Pittwater, other than the Commercial centres of Mona Vale, Newport and Avalon, and as a consequence, is the responsible authority for the enforcement of the parking regulations introduced by the ARR legislation. The Police service contract also provides the authority under the traffic laws for Council to enforce the provisions relating to the Pay and Display Reserve parking areas. The Australian Road Rules incorporate a number of changes which will have a significant affect on Pittwater Council and its residents, these changes include signage for parking and a prohibition on parking in certain areas. �No Parking� or �No Stopping�. Parking of vehicles above kerb and guttering or any other defined edge of a road is now clearly an offence. This has been introduced as the movement of vehicles and the potential obstruction of the road reserve area is a danger to pedestrians and other non- vehicle users of the road. This regulation includes the parking of vehicles across the �nature strip� on a driveway so any part of the vehicle protrudes outside the boundary of a property is an offence. It should be noted that the legislation makes provision for Council to resolve to permit parking in selected areas above the kerb. Such areas must be endorsed by the traffic committee and must be clearly indicated by the erection of approved signs. Parking vehicles to face on coming traffic is an offence. It was an offence under the Motor Traffic Regulations although with the ARR it is now clearly defined. It is now an offence for a person to ride a bicycle whilst walking a leashed dog. tonnes to 4.5 tonnes in weight. The parking of vehicles in a manner other than parallel to the roadway where there is an unbroken edge line is an offence unless the area is clearly signposted allowing the parking of vehicles at an angle and/or front or rear to road. The Roads and Traffic Authority have developed a general education campaign to inform road users throughout New South Wales of the changes to the Road Rules. The education program commenced at the end of November with a brochure delivered to all households in New South Wales with additional information provided on the RTA internet web site (full colour copies of the brochures available will be distributed separately). effectively the particular circumstances which apply in Pittwater and a procedure and campaign has been developed to address the most common problems in the area. Council has always conducted an education campaign to advise residents of various matters relating to parking regulation through media advertising, press releases and warnings issued to illegally parked vehicles. The introduction of the new ARR has been the subject of several newspaper articles and messages however a more intensive and direct program is now required. To promote the current legislation, Council�s Compliance and Road Traffic Safety branches have devised a full color brochure explaining a number of road rules. The brochure, �To Park or not to Park� �a guide to safe and legal parking� (full color brochure distributed separately) aims to complement the RTA campaign by targeting the specific concerns previously expressed by Pittwater residents. Delivery will be direct to the resident�s letterbox in those areas where Council has previously acted in respect of street parking or has received complaints. The brochures will also be available at Mona Vale and Avalon libraries, Mona Vale police station Council�s customer service centre and Internet Home Page. 1. Distribution of the �To Park or not to Park� brochure throughout the Council area. 2. Warnings, for a period of 2 weeks, will be issued to vehicles parked illegally in areas, other than main roads and main arterial roads, in which enforcement has been ongoing for a number of years. 3. 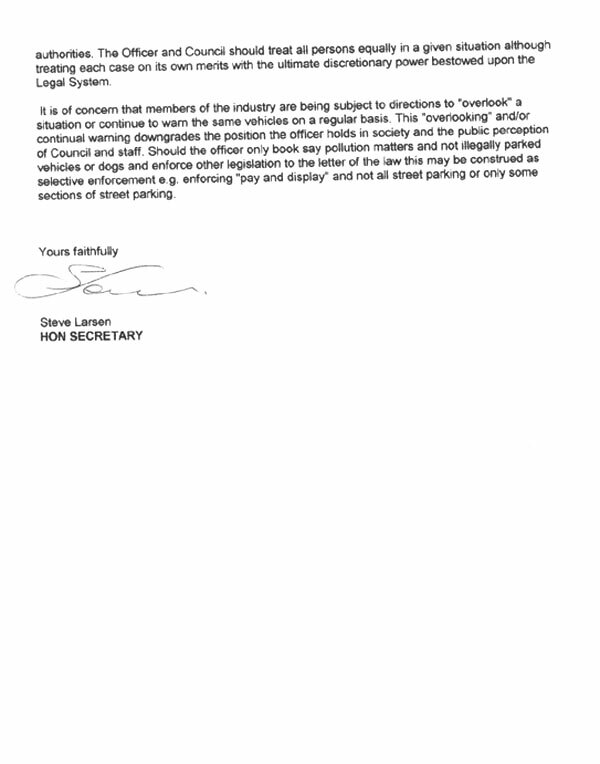 Issue infringements to all illegally parked vehicles after the warning period. 5. That Council acknowledges the introduction of the Australian Road Rules and the change to the current guiding principles for the enforcement of street parking. 6. That Council endorses the proposed education program. 7. That Council endorses the enforcement procedure outlined in Section 4.0 of the report. 8. That guidelines be prepared to address the evaluation process for areas where Council may consider a recommendation to the Traffic Committee for the approval of parking above the kerb in accordance with the Australian Road Rules. whether the Council can issue warnings rather than penalty notices for offences under the New Legislation. We address each of these matters below. The first proposition is that the issue of the power of the Council to direct its officers in respect of the performance of the relevant functions can only arise if the officers themselves are vested with a discretionary power, rather than a mandatory obligation. Absent a discretionary power, the issue of Council direction cannot be relevant. Accordingly, we address this issue at the outset, noting that it is also relevant to issue 3 below. �� authorised officer may serve a penalty notice on a person if it appears to the officer that the person has committed any of the following offences� (emphasis added). stopping on/across a driveway/other access to/from land (rule 198(2) of the ARR). As you would be aware, rule 197 of the ARR effectively states that it is a penalty notice offence to park on a footpath, shared path or dividing strip. The issue in this matter is whether the word �may� in Division 1 of Part 3 confers a discretion on the authorised officer (that is, reading the word �may� in its ordinary sense as an empowering provision) or imposes a positive duty on the authorised officer if the conditions precedent to the exercise of the power are satisfied (that is, reading the word �may� as �must�). While this may appear straightforward (�may� surely means �may� not �must�), there are volumes of cases in which Courts have construed the word �may� as �must� and �must� or �shall� as �may�, depending on the context. Because the exercise depends on the context, minds (including the minds of Judges) may well differ on precisely the same statutory provision. That having been said, we can only identify the relevant factors and express our opinion as to the proper construction of the statutory provision. First, section 9 of the Interpretation Act 1987 (NSW), states that when �may� is used in an Act or instrument in New South Wales to confer a power, then this indicates that the power may be exercised or not, at discretion. By way of contrast, section 9 states that if a duty is to be imposed, the New South Wales Act or instrument is to use the word �shall�. the making of an order against parole, if the Court was satisfied that parole was inappropriate. In this case, the only factors which we can discern which may weigh against the ordinary meaning of �may� as conferring a power rather than imposing a duty are, first, that a penalty notice is a form of criminal offence and secondly, that there is a condition precedent to the exercise of the power (namely, the appearance of an offence to the authorised officer). As to the first matter, we do not doubt that prosecutorial bodies (such as the Crown, the EPA and the Council) have a discretion whether or not to prosecute in a particular case. The Council, for example, routinely determines not to prosecute offenders for illegal building work on a range of grounds (cost, likelihood of success, deterrence value, contrition of offender etc). The EPA, indeed, has adopted formal Prosecution Guidelines which assist it in determining whether or not prosecution is an appropriate response to any particular case involving an offence. Accordingly, we do not accept that �may� necessarily means �must� merely because the context is that of the criminal law. As to the second matter, there is a condition precedent to the exercise of the power. In a number of cases, the existence of such a condition precedent in circumstances where the power exercised was judicial in character has resulted in the Court construing �may� as �must�. In this case, however, the power is not judicial and we can see no warrant for the existence of the condition changing the ordinary meaning of �may� to �must�. In consequence, we conclude that the authorised officer may issue a penalty notice, if it appears to that officer that an offence has been committed. Given this, can the Council direct the authorised officer, for example, not to exercise the power or only to exercise it in a particular way? In our view, the answer to this question must be in the negative. The power is vested by the legislation in the authorised officer and must be exercised by that officer. For the Council to give directions in respect of the exercise of the power, in our opinion, would be unlawful - this is because (by way of contrast with other Council powers) the statutes creating penalty notices do not vest the power in the Council or its General Manager to be delegated to the officers, but vest the primary power in the officers themselves. In consequence, we are not satisfied that the Council, as a matter of administrative or employment law, may lawfully direct the exercise (or non-exercise) of the power. for a purpose which the Council is authorised or required by or under the Roads Act 1993, or any other Act, to regulate traffic. For your information, we attach a copy of section 115. A roads authority cannot regulate traffic on a public road other than in accordance with the Roads Act 1993 (section 114). The Road Transport (Safety and Traffic Management) Act 1999 (section 50) also states that a person cannot install or display a prescribed traffic control device (which includes signs) without approval under Division 1C of Part 6 of the Transport Administration Act 1988. We attach, for your information, extracts from the ARR which prescribe the signs which are taken to be �prescribed traffic control devices�. As you will note, parking signs are clearly contemplated as �prescribed traffic control devices�. However, we have spoken with Mr Bob O�Keefe of the Roads and Traffic Authority (�RTA�) who has informed us that in relation to roads and road related areas, the Council has a delegated authority from the RTA to erect (approved) signs. We have not seen any delegation which suggests that the Council can take this action (although this may well be the case). It should be noted that should such a delegation exist, its terms must be strictly complied with. For example, if the delegation be in terms which allows signs to be erected on roads (and Mr O�Keefe has informed that this is the limit of the delegation), the Council will still have to obtain RTA approval for signs regulating parking on nature strips, footpaths and so on. the traffic committee must refer the proposal to the RTA with a recommendation. In respect of the design of the sign, we were advised that the RTA is currently considering a blue and white sign with the words �Parking permitted on nature strip�. It had not been determined where the sign should be placed or in what direction it should face. As an alternative to this process, it was suggested that nature strips, (etc.) could be converted to �road related areas� (which would result in substantial costs) in which case the Council could erect signs under the �delegation� Mr O�Keefe mentioned. It appears to us, therefore, that the RTA has not formalised its processes in respect of approving parking signs on nature strips and the footpath. We suggest that the Council continue to liaise with the RTA concerning the applications which it may wish to make. The Council, therefore, may only erect traffic and parking control signs in limited circumstances. If the erection of the sign is not on a road, then RTA approval is required. If it is on a road, then the Council may erect the sign but only within the scope of its delegation. It would not be open to the Council, in particular, to attempt to authorise an activity which is otherwise an offence (e.g. parking on that part of the road reserve set aside for footpaths) by the erection of a sign, other than in accordance with a RTA approval. As discussed in 1 above, we have concluded that an authorised officer has a power (but not a statutory duty) to issue a penalty notice, if it appears that an offence has been committed. This applies, in our view, to the whole range of penalty notice offences including pollution and waste disposal offences. There may be cases, therefore, where the authorised officer considers whether or not it is appropriate to issue a warning, rather than a penalty notice. This issue requires consideration of the nature of the discretion itself. Any discretion must be exercised lawfully. It must not be exercised (or not exercised) for any improper or irrelevant reason or the exercise (or non-exercise) is unlawful conduct and, indeed, may even be corrupt conduct depending on the circumstances. As a consequence, it is our opinion that while the statute confers a power (rather than imposes a duty), an authorised officer, if satisfied that the offence has been committed, would only be able to exercise a discretion not to issue the penalty notice in very limited circumstances. To do otherwise runs the real risk of having acted unlawfully (because of a miscarriage of the exercise of discretion). These limited circumstances would potentially include first offenders but could not, in our view, properly include repeat offenders or such matters as inability to pay (a matter for the debt recovery process not the issue of the notice), the identity of the offender or the mere absence of harm in the case of a repeat offender. The authorised officers should also appreciate that a failure to issue a penalty notice, in circumstances where the offence appears to have been committed, may not only run the risk of improperly exercising the discretion, but may also expose the Council and the officers to claims for damages if harm is caused by the breach. For example, if a car is illegally parked in a dangerous position then, regardless of the existence of the power under the statute, a common law duty of care may well arise in respect of both the Council and the authorised officer to take all lawfully available steps to abate the harm including issuing the penalty notices, which may act as a prompt to cease the illegality or as a deterrent in the future. Accordingly, while we are satisfied that there is a power to issue warnings rather than penalty notices, it is our view this power is very limited and that, in practice, avoiding the risk of an improper, unlawful or even corrupt exercise of the power, would exclude all cases other than first offences where no risk of harm is caused by the illegality. Because the issue of identifying a risk of harm may involve relatively fine factual distinctions, by far the safer course (from the perspective of the Council and the authorised officer) is for the notices to be issued. We should note, of course, that the discussion above assumes that the authorised officer is satisfied that there appears to be an offence. If not so satisfied, the power to issue the notice cannot be exercised at all. To purport to exercise the power, if not so satisfied, is itself improper and unlawful. It must appear to the officer that the offence has been committed - not that the offence might have been committed. The latter is insufficient to trigger the power. Please contact us if you wish to discuss this matter further. A useful place at which to begin a consideration of some of the important and complex issues raised by this subject is, perhaps, the beginning. It may be that the most useful contribution I can make is to go back to first principles, and to recall some fundamental considerations relating to the role of police in our society. These considerations provide the framework for a definition of the role of the police service. They also provide the context of principle in which practical constraints governing the operations of the service may he proposed and evaluated. The framers of our own Federal Commonwealth Constitution (who were for the most part lawyers) found the American instrument of government an incomparable model. They could not escape its fascination (Dixon 1935. p.597). However, in Australia we also inherited the British tradition of responsible government. Executive power is in practice exercised by, or by persons under the direction of, ministers of state, who are themselves members of parliament and politically responsible to the legislature. Furthermore, we do not pursue separateness to the same lengths as in the United States. Even so, The principle has taken deep root in our community, and the theory of the *separateness of legislative, executive and judicial functions has gained general acceptance. The legislative power, The power to make laws, is exercised by the parliament. The executive power comprehends those aspects of the organisation and administration of society which are, at any given time, regarded as properly a matter of governmental responsibility. Ideas as to what matters are properly regarded as the responsibility of government chance from dine to time, but such matters have always included the maintenance of external and internal security, The promotion of law and order, and the keeping of the peace. Consequently, The operations of the defence forces and of the police forces are accepted as responsibilities of the executive government. In different communities, The division of functions between the military and the police may vary but, whatever the precise division that is adopted in any place or at any time, The maintenance of internal peace and security is an essential, and indeed basic, aspect of executive power. The judicial power involves the interpretation and declaration of the law, The administration of criminal justice by determining whether persons have been guilty of crime and imposing punishment if they are found guilty, and the administration of civil justice, which involves the resolution of disputes as to legal rights and obligations between citizen and citizen, or between citizens and the executive government. The exercise of judicial power may involve, from time to time, decision-making as to the extent of legislative power or executive power and the judiciary are from time to lime called upon to resolve disputes as to where legislative power or executive power resides. The fact that the police force is part of the executive branch of government carries with it, as a corollary, certain consequences flowing from the principle of separation of powers. First, police do not exercise legislative power; that is to say, they do not make laws. This observation may seem trite, but its implications are sometimes overlooked. Less obvious, but equally important is the need to guard against vesting in the police discretionary powers which, for practical purposes, may amount to powers to make law, or to dispense with the compliance with the law. There is a need to be on guard against the temptation, in the interests of administrative convenience, to confer upon officers of the executive government, including members of the police force, discretionary powers to impose legal obligations upon some citizens or to relieve other citizens of obligations. Appropriate delegation of power to make rules and regulations subject to parliamentary scrutiny is one thing, but it is not the function of the police to make the law, or to decide by whom, and to what extent, the law is to he obeyed. There is a related consideration which is worth remembering. It affects the exercise by parliament of its law-making power. On occasions laws are made, or left on the statute-book, which have a width, or which operate with a theoretical severity, that is not intended to apply in practice. This can produce the result that the police are put in the position of having a de facto discretion as to whether and in what circumstances they will enforce the law. It would be invidious to give particular illustrations, but we can all think of laws which, because they are regarded as outdated, or draconian, or politically sensitive, are not expected to be enforced uniformly, or in some cases are not enforced at all. This is not only an destructive of morale in the community and in the police force; it is constitutionally repugnant. The police should not be left in a position where it is up to them to decide which laws they will enforce. Bad laws should be repealed or reformed, not left to be tempered in their practical operation by police discretion. A second consequence of the separation of powers is that it is no part of the function of the police to exercise judicial power. It is for the judiciary, not the police, to determine whether people are guilty or innocent of crimes, and it is for the judiciary, not the police, to punish citizens who have broken the law. To take one simple but important example, the power of arrest is a power that is given for the purpose of taking into custody suspected wrongdoers in circumstances where such custody is necessary for the proper administration of justice. It is not a power that is to be exercised punitively. The police are not given a power to arrest suspected offenders for the purpose of enabling the police *to punish such people, and the exercise of a power of arrest for such a purpose would be a serious abuse of power. Activities such as apprehension and questioning of suspects, fingerprinting, detention, and refusing of bail are all administrative activities that are intended to he aimed at furthering the course of justice, enabling people accused of crime to he brought to and securing the conviction of the guilty and the acquittal of the innocent. They are not intended themselves to constitute some additional form of punishment over and above that imposed by the courts. To give one practical illustration, many criminal proceedings are of a kind that can be commenced either by arrest upon warrant or, alternatively, by the much less dramatic procedure of the issue of a summons. Where there is no reasonable apprehension that an accused person will fail to turn up at court to answer the charges, and where the issue of a summons is an available procedure, it would be quite wrong to use the procedure of arrest or warrant where the purpose of doing so is to display the law operating with its full severity. No human organisation can he perfect, and it is inevitable that from time to lime we will see aspects of police behaviour that we find troubling. In such cases it will often happen that what is involved amounts to a contravention of one of these basic principles which in turn flow from the separation of powers: the police should not act as though they have the power to make or unmake the law, and they should not act as though they have the power to punish wrong-doers. For similar reasons, the legislature, for its part, must take care to avoid conferring upon the police powers which are, in their nature, legislative prejudicial. A proper understanding of the role of the police force as part of the executive arm of government should assist to prevent these things from occurring. Another constitutional principle which is of large practical significance for the role and operations of the police force is the rule of law. In our community no one is above the law, and this includes those who apply and enforce it. The police have to obey the law like anybody else, and the primary method of regulating their conduct is by the enactment of laws, rules and regulations which, in the last resort, and if necessary, will be enforced by the courts. We are so accustomed to the idea of the supremacy of the law, that we do not reflect upon the degree to which it has operated to determine the character of the institutions in the countries to which the English common law has carried ... Wherever the common law has gone the theory of the supremacy of the law has necessarily gone with it (Dixon 1935, p.595). Our community takes it for granted that the police must obey the ordinary law of the land and should, like anybody else, be punished for transgressions. Maintenance of these standards requires adequate procedures for internal police investigation, and the public require assurance as to the efficacy of such procedures. There are two ultimate sanctions for the inadequacy or failure of such procedures: judicial and political. The courts will enforce the law against officers of the executive government; and the principle of ministerial responsibility will enable parliamentary scrutiny of alleged shortcomings. Forcible police entry into premises for the purpose of effecting an arrest, unless made on reasonable grounds and in compliance with common law and statutory requirements, may expose officers to both civil and criminal liability (e.g. Lippl v Haines (1989),18 NSWLR, 620). Police who obtain search warrants are obliged to comply with the strict technical requirements of the statutes which permit such intrusions into privacy and property (e.g. Commissioner of Police v Atkinson (1991), 23 NSWLR, 495). There is one important area in which the law imposes stringent requirements upon police officers but in respect of which the legislature could well assist them by defining more precisely their powers and obligations. The courts have repeatedly insisted upon the duty of arresting officers to take an arrested person before a justice or magistrate as soon as practicable, so that questions of bail may be dealt with (e.g. Williams v The Queen (1986), 161 CLR. 278). This is a rule of basic importance * for the liberty of the subject. in practice, however, it often collides with a police desire to interrogate a suspect. Plainly, the exigencies of arrest and detention and of what might be an ongoing process of police inquiry can, in practice, make it very difficult to know when a police officer passes beyond the area of apprehension and lawful investigation and into the area of unlawful detention. In other places there are statutory provisions and regulations which lay down clearly defined standards in this regard, including time limits for bringing an arrested person before a justice. The law and practice in New South Wales on this subject should, in my view, be clarified in the interests of all concerned. This is an area in which bright-line standards can operate for the protection of both police and citizens. Citizens who complain about the failure of police officers to observe the law nowadays demand reasonable assurance that their complaints are dealt with adequately and impartially. Procedures of internal discipline, and external scrutiny such as that which comes from the ombudsman, are important practical additions to the process of law administered by the judicial am of government. If police from time to time come into collision with the law, it is only fair to remember that the nature of the tasks which we expect them to perform places them regularly in difficult and dangerous situations. Most of us have no difficulty in complying with the law which prohibits assaulting other persons. I wonder, however, how most of us would get on if we were engaged in a task that necessarily brought us into close and frequently dangerous physical contact with violent people. It is often said that the police represent a cross-section of the community and are no better or worse than ordinary people. Ordinary people, however, do not carry guns or have the power or the duty to place others under arrest and lock them up. The obligation to comply with the laws that govern the conduct of ordinary people can in practice, create serious difficulties for police officers. It is, however, an obligation upon which we must continue to insist. Where we see a good man and hear or see a good thing, there we take little heed. But when we see once an evil deed, thereon we gape, thereof we talk and feed ourself all day with the filthy delight of evil communication. Let a good man preach, a short tale shall serve us thereof, and we shall neither much regard his exhortation nor his good example. But let a lewd friar be taken with a wench, we will jest and rail upon the whole order all the year after and say, 'lo what (an) example they give us' (Marius 1985, p.352). We are right to insist upon high standards in the operation of our police force. We must keep steadily in mind that the police force, as part of the executive branch of government is not to exercise either legislative or judicial power. And we must insist as a minimum condition upon the application of the rule of law to all aspects of the activities of police. I would, however, add in conclusion that we should also acknowledge the importance and the difficulty of the tasks which we expect to be performed by police officers, and we should bear in mind that they deserve our support and encouragement. Our requirements and expectations of them are high, and we should be ready to praise success as well as to criticise failure. "II n'y a point encore de liberte si la puissance de juger n'est pas separee de la puissance legislative et de l'executrice". There is an interesting historical discussion of the subject in the judgment of Windeyer J in The Queen v Trade Practices Tribunal: ex parte Tasmanian Breweries Pty Ltd (1971). 123 CLR 361.